Described as a symbol of Detroit’s living spirit, Cobo Center is in the midst of a $279 million renovation, which includes a soaring new atrium that opens onto the city’s iconic riverfront. The renovation at Cobo aims to catalyze the revitalization of Detroit, and in the atrium and adjacent restrooms, TEC® products helped tile installers create a vibrant space. With a panoramic view of the river through floor-to-ceiling glass windows, Cobo’s three-story atrium creates a physical link between the convention center’s dramatic new riverfront entrance and main concourse. The 250-by-65-foot atrium can host 600 people seated for a meal, 1,000 seated theater-style and 1,200 for receptions. Large-format tiles, installed with a wide range of TEC® products, span the atrium’s floor. Installers also used TEC® products to place 1-by-2-foot floor tiles and 1-by-3 meter large thin wall panels in nearby restrooms. Cobo hosts two of the Motor City’s most iconic annual events: the North American International Auto Show, one of the largest auto shows on the continent, and Autorama, a large showcase of custom cars. With consideration for these events, the TEC® system underwent testing before installation to determine how it would perform under heavy wheel loads. Although today, 2-foot-by-4-foot beige and white tiles deliver a simple, refined appearance to the atrium, TEC® products addressed a variety of challenges in the space prior to their installation. TEC® Multipurpose Primer and HydraFlex™ Waterproofing Crack Isolation Membrane were used both in the restrooms and in the atrium. 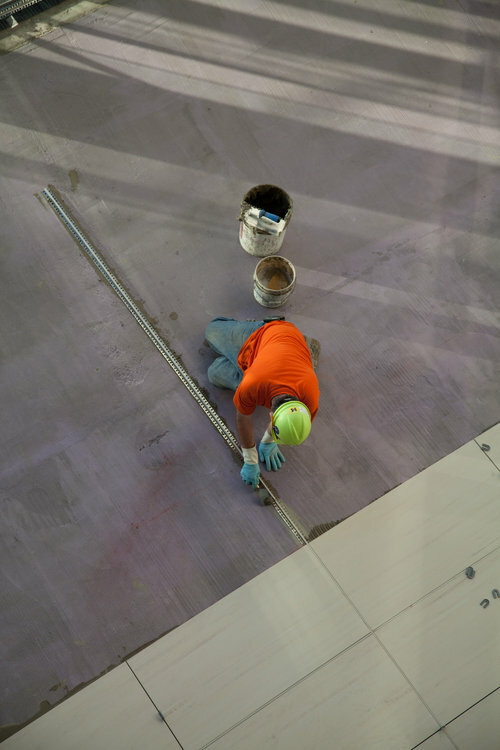 In the restrooms, HydraFlex™ provides waterproofing, while in the atrium, crack isolation was most important. “In Michigan, the ground is always moving. It’s freezing and thawing, which can cause the substrate to expand and contract. That’s why we use HydraFlex™,” says Matt Shumard, finisher for Michielutti Bros, Inc.
HydraFlex™ may help prevent future cracking in the substrate, but installers also needed to address its existing problems. An even substrate was crucial for successful installation of the large thin tile used in the atrium. However, when installers began work, they found an uneven subfloor and turned to TEC® Fast-Set Deep Patch to help correct the problem. “The substrate was very challenging. It was up to 1/4“ higher and 2” lower than the level plane, and we used Fast-Set Deep Patch to level it. Fast-Set Deep Patch is very strong, and it sets fast. Now we have a flat floor – you can roll a quarter across it,” says Shumard. According to Bob Michielutti, TEC® Ultimate Large Tile Mortar also contributes to the floor’s uniform surface. Despite the fact that installers used two different colors of tile with slightly different thicknesses in the atrium, TEC® Ultimate Large Tile Mortar helped them account for that difference and achieve a more consistent floor. It also delivers its non-sag characteristics to the large, thin panels installed on the walls of the convention center’s restrooms, and was used to install tile on their floors as well. In Cobo’s atrium and restrooms, another product in the TEC® roster, TEC® Power Grout® Ultimate Performance Grout, provides stain-, crack- and efflorescence-resistance and color uniformity. TEC® products will also be used for the installation of the ceramic wall tile in the convention center’s kitchen. The Cobo Center atrium was completed in late 2013. The convention center’s renovation began in September of 2009 and is expected to be completed by the end of 2014. Other aspects of the renovation include a 40,000-square-foot grand ballroom, a TV broadcast studio with satellite uplink capability, giant exterior video walls for event information and an open-air terrace overlooking the river for event and community programming. Click here for more information and product recommendations on large format tile installations and installations in freeze/thaw conditions, like this one.